Gary is interested in lots of things: philosophy, art, being accepted as a philosophy and art-liking football fan, sexuality, animals, crime, charity work, fanaticism and Lionel Ritchie being just a taster. He is keen to convince you that he’s really just a down-to-earth northern lad, and sometimes performs as Gary Ha Ha Hartley just so people know that jokes will be forthcoming in the midst of meandering manifestos on just about everything. Edgy, nervy, raw, playful, angry, embittered, usually all in the space of a sentence or two, Gary aims to take you down dingy labyrinthine alleys of belly laughs aplenty and occasional provocation to think a little. You can catch Gary at such venues as Laughing Horse Camden and Soho, Monkey Business Comedy Club in Kentish Town, I don’t Like Mondays in Clapham (where he is resident comic), The Bedford in Balham and anywhere else that embraces the dingier side. 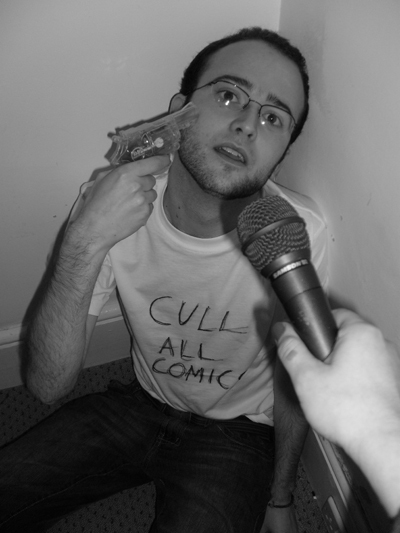 He’ll also be attempting to put on ‘The Tangent’, a kind of shambolic standup show in August at the 2008 Camden Fringe alongside droll, confused, Puerto Rican Welshman Xave Fernandez.